Finally had time to assemble the stiles, rails, and louvers into my 8 section plantation shutter project, after a number of months tackling other life issues. 1.) 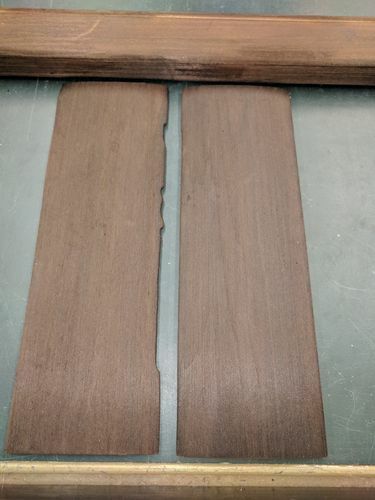 purchasing slats from Rockler has it’s advantages and disadvantages. The advantage is apparent in that you do not have to mill your own slats. The disadvantage is you do not mill your own slats :) I ordered the slats from Rockler and they came 4’1”+/- x 6 pieces. Well, not all the pieces were dimensioned to each other. Meaning, they were to be all 3 1/2” tall but some were 1/8” to large or 1/8” too small. I may try to mill my own slats next time to have them all identical. 2.) 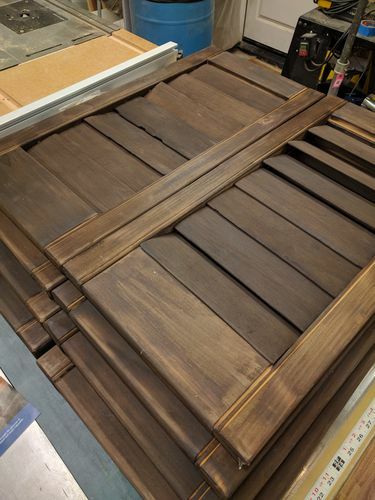 I used the Rockler plantation shutter jigs plus dowel jig. The louver/slat jig works great for drilling holes. The jig to drill the holes in the ends of the slats… I’m off 1/16” – 1/8” which I believe is due to the inconsistent dimension from 6 pieces so can’t blame this jig (yet). The dowel jig, eh… I wouldn’t use it again. Sure, it’s hard plastic and you can clamp it down using a single clamp… but we all know when you put torque on anything that is held down with a single clamp, things move. I tried to go perpendicular/ 90 degrees with my hand held drill so maybe it was user error. Next time, I’ll use my router mortise jig for making accurate lined up holes. 3.) charring basswood. I really like how this turned out. I went “light” charring on the stiles & rails, more heavier on the slats. Learned, the slats char and burn away material on the edges too easily so next time to be careful, as you can see in the picture below. Still have to do the front bar & holes and then mouse hole for the bar. Then, hvlp. Then, hinges and final installation.